This is a repost of my review of the review that ran at last year's Tribeca Film Festival. Shawn Snyder's TO DUST is not going to be what you expect. Billed in the Tribeca literature as a buddy comedy, it really isn't. To be certain it has some of the biggest, deepest laughs of any film in the festival, but it isn't really a comedy. It is more like life, stuck somewhere between the laughter and the tears. 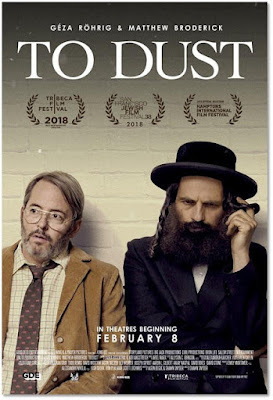 The plot of the film follows a Hasidic cantor as he tries to over come the loss of his wife to cancer. More to the point he tries desperately to get past the thought of her body decaying in the grave. Since some part of her soul is tied to the body and will suffer until it has turned to dust, he needs to know how long that will be with the result he ends up talking to a science professor who becomes an unwilling partner in crime. Frequently funny the film actually an examination of grief and suffering. As our hero suffers as does his children (who have a funny sideline about a Dybbuk) and his mother. It raises questions about how long should we mourn and must we follow everyone else? There is also the notions of science vs religion kicking around. The answers when they come are not always easy. Everyone in the cast is wonderful, with special praise going to Matthew Broderick who turns his usual schitck on its head to create a wonderful man of science to guide the grieving cantor. For me this is one of the meatiest films at this year's Tribeca. It was the 38th film I saw and it was the first one that made me both laugh and think.It was a film I pondered for a long time afterward as I wrestled with various notions of life and death.